Choose below which year NBA 2K19 MyTeam packs you want to open with our NBA 2K19 pack opener. If you are logged in, any players you get in a pack will be recorded. Try to complete the full set of pack opening and be rewarded! Our NBA 2K Pack Simulator is complete free to all players, you can feel free to enjoy the fun of packing here. And if you are looking for cheap NBA 2K19 MT coins for Xbox One, PS4, PC, Switch to enjoy the real packing experience in-game, welcome to buy NBA 2K19 MT points fast and safely on Goldkk.Com, use coupon “GDK” to save 5% OFF! NBA 2K19 Pack Simulator - Complete free NBA 2K19 Pack Simulator! This pack contains a random of 5 players. 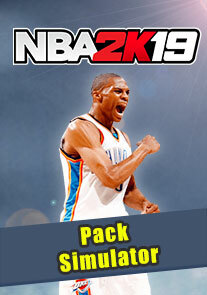 Click START PACK to simulate open the pack and test your luck with odds based on NBA 2K19 My Team Packs, try to get the top players and rank on the top of our leaderboard of NBA 2K19 Pack Simulator Ranking List! NBA 2K19 Draft Simulator - Complete free and funny NBA 2K19 Drafting Simulator! 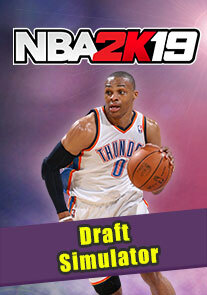 Click START PACK to draft13 players for your MyTeam from 13 rounds of packing (each one contains 5 players). Pick up 2 players for each position to get double score, and a gold or better player from the last two round can ensure you a higher score on our leaderboard of NBA 2K19 Drafting Simulator Ranking List!